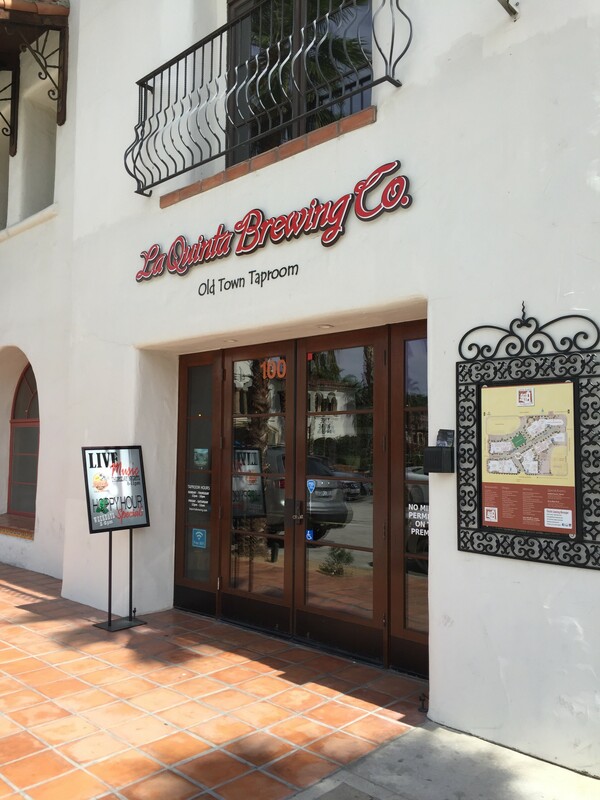 A Beer At…La Quinta Brewing Co. The La Quinta Brewing Co., and palm trees. The Bar Towel continues our series entitled “A Beer At…”, where we feature a single bar or restaurant, have a beer or two and get a feel for what makes it special. 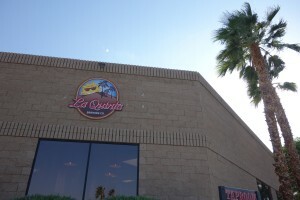 This visit is to the La Quinta Brewing Co., located in the Coachella Valley of California. Good beer is everywhere. From big city to small village, it seems nowadays that there’s a small brewery there now, and thriving. This is no different in the desert region of California, where although the heat can be unlike anything we see this side of the border, plenty of good beer is available to help cool things down. In the Coachella Valley, probably most well known around these parts for the music festival named after it, contains a row of small cities including Palm Springs, Palm Desert, Indian Wells, La Quinta and Indio, about 130 miles inland from Los Angeles. It was here recently where I spent a few days in La Quinta, a golfer’s haven and home to the La Quinta Brewing Co. which I was able to visit. The draught lineup at the Old Town Taproom. 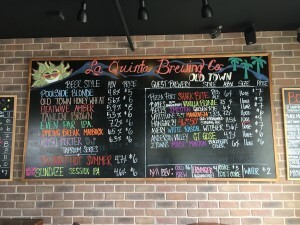 La Quinta Brewing Co. is actually comprised of two locations, the actual brewery which includes a taproom, and a second, non-brewing taproom. The brewery is located in an industrial area just off Interstate 10 in Palm Desert, with the views of the Joshua Tree mountains in the distance. The brewery’s taproom has about a dozen beers available – during my visit there was a wide range of styles including a blonde, amber, honey wheat, brown, American IPA, coffee porter (plus the bourbon barrel aged version, which won the gold medal in the Wood and Barrel Aged Beer category of the 2016 World Beer Cup), session IPA, blood orange ale, maibock and Irish red. The brewery taproom was a cozy spot with samples, flights, glasses and merchandise available. Their second location is in an area of La Quinta called Old Town, a quaint little walkable area with shops and restaurants. Walking into the Old Town Taproom is a respite from the usual heat that is common in the region, with a direct line right to the bar, where the orders are taken. Similar to the brewery taproom plenty of beer options abound here, as La Quinta eschews traditional seasonal choices for a wide range of styles, as it’s always hot here. There was much overlap from the offerings at the brewery taproom, but with the additional of eight guest taps accompanying the house beers, including offerings from Pizza Port, Anderson Valley, Hangar 24 and others. It’s a simple place, made for drinking. It’s a fairly stark interior, marked by a concrete floor and metal tables and chairs. But it’s a warm spot, where’s a long bar around the taps, communal high top tables, TVs and board games. It has the definite feel of a locals place, with folks at the bar on a weekday afternoon chatting about happenings about town, tales from working at the local resorts and previous nights at the taproom. A side door access leads to a nice patio facing some of the other shops of Old Town, where you can sit at a table and get occasionally misted with overhanging mist ropes. It’s a nice touch when you’d like a little heat and sunshine but with some relief from time to time. The Coachella Valley area is a great destination – quite literally unlike anything in Canada. It’s a resort community built up from the desert, where it is easy to spend the days taking in the perpetual warmth. 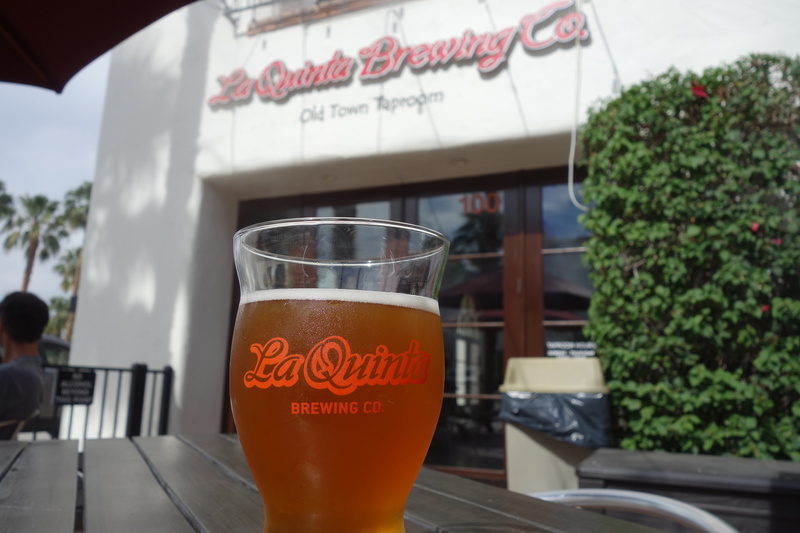 But with La Quinta Brewing and the area’s emerging scene, there is now some great beer to savour in the sunshine. The La Quinta Brewery Taproom is located at 77917 Wildcat Drive in Palm Desert, CA and is open Sunday-Thursday from 2pm-8pm, and Friday-Saturday from 2pm-9pm. The Old Town Taproom is located at 78-065 Main Street #100 in La Quinta, CA and is open Sunday-Thursday 12pm-10pm, and Friday-Saturday 12pm-12am. Note that minors (under 21 years of age) are not permitted, and food is not served at either location.